In the Fray: the writings of Gary Andrew Poole—author of PacMan: Behind the Scenes with Manny Pacquiao, The Galloping Ghost, + a contributor to TIME, Esquire and The Atlantic » Blog Archive » Hello God, It’s Me, Manny Pacquiao: What Does Defeat Mean? Hello God, It’s Me, Manny Pacquiao: What Does Defeat Mean? Is God trying to tell Manny Pacquiao something? On Saturday night in Las Vegas, the politician and newly re-energized Christian from the Philippines was a hitting machine, pounding his American opponent, Timothy Bradley, 28, into confusion and almost overt fear. Pacquiao, 33, might not have had the same electrifying foot speed he had in his best bouts and might not have thrown his combinations with the same intensity, but in Round 2, Pacquiao swung one of his red-gloved hands and hit Bradley so hard that the Filipino twisted one of the American’s ankles and fractured the other. When he returned to his corner, Bradley told his trainer about the injury but soldiered on. He took 253 Pacquiao punches in all, connecting with only 159. He would enter the postfight press conference in a wheelchair. 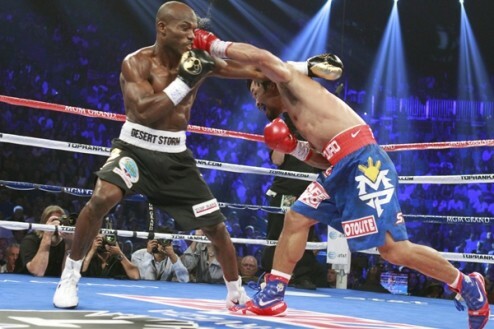 So Manny Pacquiao-Tim Bradley, huh? Sitting ringside, I scored the fight 10-2, Pacquiao. Didn’t even look close to me. Here is what I wrote about the fight and how religion played a role in TIME. And my take for The Atlantic. Here is a color piece I wrote for Esquire Philippines. What does this mean for Pacquiao-Mayweather? It’s too bad the two men haven’t figured out how to meet in the ring. My take on that, and the fight. Here. In Esquire. This entry was written by Poole, posted on June 11, 2012 at 10:13 am, filed under Bad Decisions, Boxing, PacMan. Bookmark the permalink. Follow any comments here with the RSS feed for this post.